In this section I will describe and reflect on technology strategies for the management and distribution of open educational resources and how my understanding has evolved as a result of participating in number of national and institutional development programmes and initiatives. In early 2015 while working with the Centre for Education Technology and Interoperability Standards (Cetis) I undertook an Open Education Technology and Practice consultancy on behalf of the Director of Learning, Teaching and Web at the University of Edinburgh. I was responsible for scoping and managing the consultancy project and together with my colleague Phil Barker, we co-authored two reports, one of which focused on Technology Approaches to OER Management . This report provided an overview of selected open educational resource (OER) repositories and aggregators accompanied by an assessment of their fit to the University’s strategic mission. The report covers institutional repositories and OER websites, subject specific repositories and aggregators, content type specific repositories, and general and global repositories and aggregators. My co-author and I evaluated each repository on the basis of their scope (what kind of content the repository hosts, what kind of licences used, etc), presentation (visual and user interface, how the content is accessed and presented), user community (who are the intended end users of the repository), technology and interoperability (what platform is the repository built on, which technical standards it implements). We concluded the report with a synthesis and analysis of the various technologies evaluated against these parameters, together with a suggested way forward for the university to consider. See below for discussion and reflection on the approach my co-author and I recommended to the university. The findings of our report informed the development of the University of Edinburgh’s one stop shop for open educational resources Open.Ed and I went on to liaise with Stuart Nicol, Online and Open Education Team Manager, during the development of this portal . 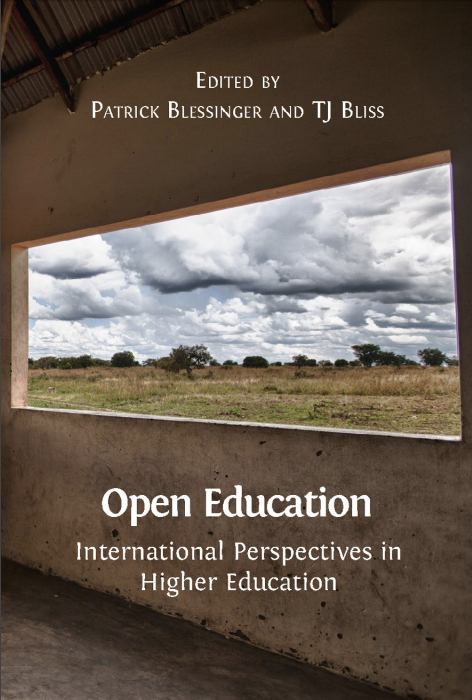 The following year, my co-author and I repurposed some of the research we had undertaken for this consultancy to write a chapter on “Technology Strategies for OER Dissemination” for the open ebook Open Education: International Perspectives in Higher Education . The Technology Approaches to OER Management report, the assessment of the technologies evaluated and the recommendations put forward to the University of Edinburgh were informed by my experience of working for many years in the area of technology strategies to support the management and distribution of educational content. I have worked in this area since 2000 and over the years my perspective and understanding has changed and evolved as technologies, tools, standards, and approaches to licensing and managing educational resources have developed. To provide some background and context, between 2002 and 2009, as the Assistant Director of the Jisc Innovation Support Centre Cetis , I was responsible for developing the technical strategy for a number of national Jisc development programmes including Exchange for Learning (X4L), Re:PRODUCE, and the Repositories and Preservation Programme. I was also a member of the Steering Committee of Jorum , the national learning resource repository, between 2005 and 2016. The technology approach advocated for much of this time, which I contributed to developing, recommended using national and institutional repositories, implementing learning technology interoperability standards, mandatory metadata application profiles and formal controlled vocabularies. While these approaches had considerable success for the management of Open Access scholarly works, they were much less successful for the management of teaching and learning resources. Subsequently when Jisc launched the UK Open Educational Resources (UKOER) pilot programme in 2009, I was again responsible for shaping the technical strategy and together with my Cetis colleagues I suggested a rather different approach . In contrast to previous programmes, I advocated a lightweight approach to technology, no formal metadata standards or controlled vocabularies were recommended, and projects were given free rein to use any dissemination platform they chose, provided that their content was freely available and under an open licence. Among the few mandatory requirements were that resources should also be represented in the Jorum national repository either by linking or through direct deposit, and tagged #ukoer. The aim of this approach was to encourage projects to focus on the creation and dissemination of open educational content rather than focusing on tools and technologies. This approach, which I believe is more in keeping with the ethos of open education, informed the recommendations that I put forward to the University of Edinburgh in Technology Approaches to OER Management; to use existing web based media sharing sites which are already familiar to staff and students, to create a central register of resources released on these sites, and to explore the use of Solvonauts open search engine to aggregate resources. Rather than investing in an institutional OER repository which could be costly to maintain and support, the focus is on encouraging staff to use, create and share OER through channels that are familiar and convenient. I believe this approach was particularly well suited to the development of the new Open.Ed portal as, rather than being constrained by a single technology such as a repository, it has allowed the service to grow organically and incorporate a wide range of resource sharing platforms, including youtube, flickr, Wikimedia Commons, Sketchfab, TES Connect and Media Hopper . A trial is also currently underway to implement Solvonauts as an OER aggregator for Open.Ed but at this stage it is too early to say how this will evolve. While there are some risks associated with using commercial online resource sharing platforms to host educational content, I believe there is growing evidence that these platforms offer greater longevity than national and institutional repositories. As a case in point, Jorum, the UK’s national learning resource repository which housed the archive of content created by the UKOER Programmes was closed in 2016 and a significant volume of content became inaccessible. I reflected on the implications of this closure and the impact on OER sustainability in a series of online discussions and blog posts , which culminated in a workshop I co-authored and presented at the OER16 Conference Web Today, Gone Tomorrow: How can we ensure continuing access to OERs? which explored different perspectives and dimensions of practise on technical and curatorial aspects of OER sustainability. Clearly technologies for the management and dissemination of online resources will continue to change and evolve, as will the requirements of the University of Edinburgh’s Open.Ed portal. I aim to keep up to date with new technologies as they emerge by engaging with the global open education and learning technology communities in order to ensure that my understanding of these technologies continues to best meet the changing needs of the University and the sector more widely. See image above for a screen shot of the cover page of this report. Barker, P. and Campbell, L.M. (2015), Technology Approaches to OER Management, a Cetis technical briefing for the University of Edinburgh. 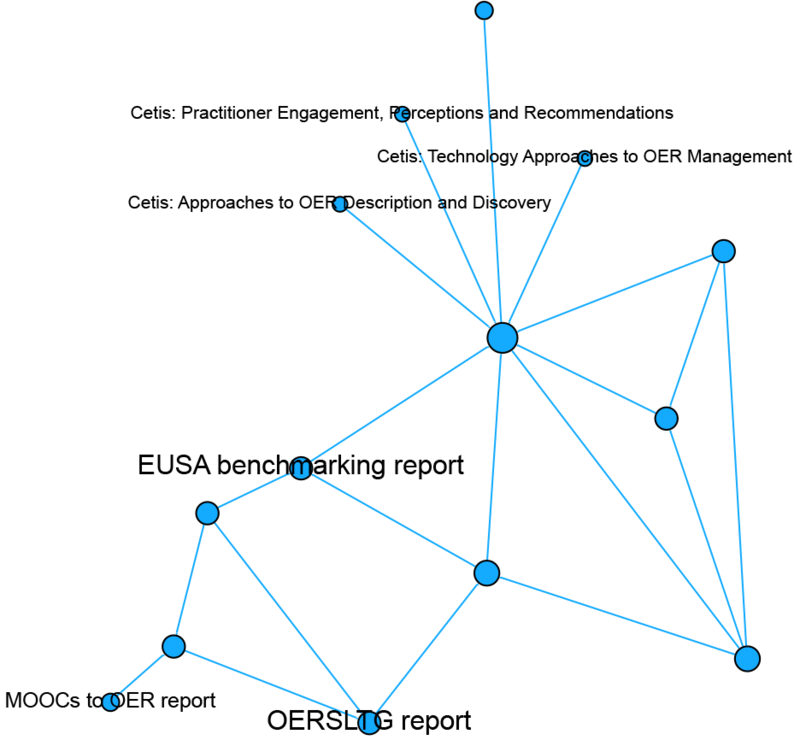 Attached is a network diagram I used as part of my masters dissertation for the MSc in Digital Education, Doing OER, showing the reports that were involved in the development of the Edinburgh OER policy. 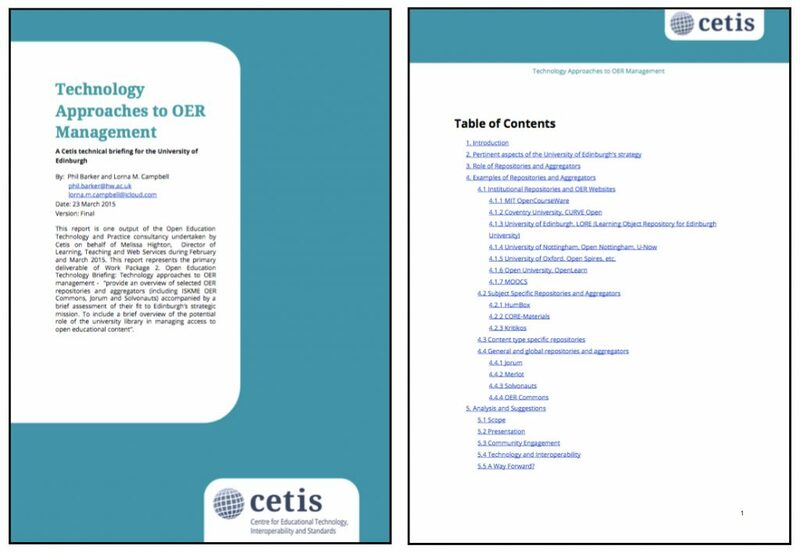 A short statement:”Technology Approaches to OER Management” by Lorna Campbell and Phil Barker was one of three reports commissioned from Cetis by the University of Edinburgh. The reports were part of a wider scoping exercise that informed the development of both institutional OER policy and technical platform for the University’s online OER presence.